Arizona Puma is a non-profit organization that depends on volunteers to get things done. In fact, our entire staff is volunteer. The Club is not a professional organization with a paid staff and coaches. It is run by former track athletes and parents who volunteer their time and energy to promote Track & Field in support of Valley youth. Puma parents have always proudly represented our club. Pitching in and helping is part of the Puma experience. There are many ways that you can pitch in and help during the season. Uniforms are issued to athletes during the season and must be collected at the end. We need a volunteer to manage that. Meet entries must be completed by the entry deadlines, so, assistance is needed to insure that our athletes are signed up in a timely manner and we don’t miss anyone. Each season we are always looking for coaching help or just someone to run a planned workout. Each club in our Association has a responsibility assigned at our meets. 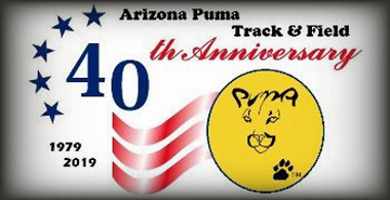 Arizona Puma is responsible for running the High Jump. We seek parent volunteers to help run this event at each meet to insure that our club is meeting its commitment to all of Arizona’s athletes. The Association is also on the lookout for computer savvy folks to help run the finish line system at our meets. All coaches and volunteers who come in contact with youth athletes during registered club practices or other club-related track and field activities must complete a background check. USA Track & Field, Inc. (USATF) strongly believes in a culture of safe sport, promoting respect and preventing abuse to create a healthy environment in which our athletes can train and compete. Accordingly, USATF requires all club coaches and volunteers who come in contact with athletes during registered club practices or other club-related activities to be USATF SafeSport compliant. A USATF member is SafeSport compliant once he/she has successfully completed the required NCSI Background Screen and U.S. Center for SafeSport training. Once a USATF volunteer is SafeSport compliant, he/she is added to the USATF SafeSport list on our website. To become registered a coach must complete the application process which includes the steps outlined below. Effective January 2019, all existing and future Coaches Registry applicants must fulfill the new requirement of the Education Standard. For 2019 ALL Coaches / volunteers have to be on the Coaches Registry / Volunteer list. Coaches/Volunteers will pay $16.00 to have a criminal background check performed. Stuff you need to know!